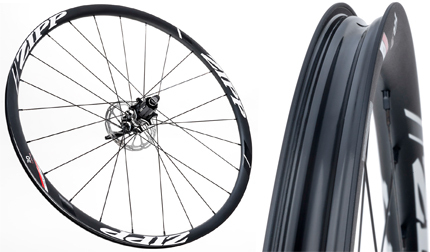 The Zipp 30 Course tubular front wheel is disc specific, tubeless ready compatible and caters for road, cyclo-cross, and gravel (including adventure) riding. The 30 Course provides the versatility demanded by the emerging new era of road riding. As a complete wheelset, the 30 Course disc-brake, with its 25mm external and 21mm internal rim widths, incorporates design innovations from the 202 Firecrest Carbon clincher profile for low aerodynamic drag, greater stability and predictability in crosswinds. That extra wide rim platform allows for increased air volume, which spreads the tyre casing. That helps increase the contact patch with the ground. The result is improved cornering grip and increased comfort on the road, mud and everything in between. The 30 Course Disc-brake also utilises the new lightweight 77/177D hubset for improved wheel versatility, durability and simplicity. These lightweight hubs also come with thru-axle end caps that can be swapped by hand (front: 12x100mm & 15x100mm, rear: 12x135mm & 12x142mm). this makes them very versatile and able to travel over many terrains apart from road (tarmac). The hubs also feature new distinctive hub graphics and newly designed quick-release skewers that have a wider more ergonomic handle which provides more leverage for opening and closing. When closed, lever contours neatly with the frame. Ruota anteriore tubolare per freni a disco Zipp 30 Course valutazione 4.0 di 5 di 1. Rated 4 di 5 di andreabo da prodotto ben fatto Ruota affidabile, mozzo ottimo e anche esteticamente è ben fatta. Un pò pesante ottima come ruota da allenamento su strada. Buon prezzo di Wiggle !! !